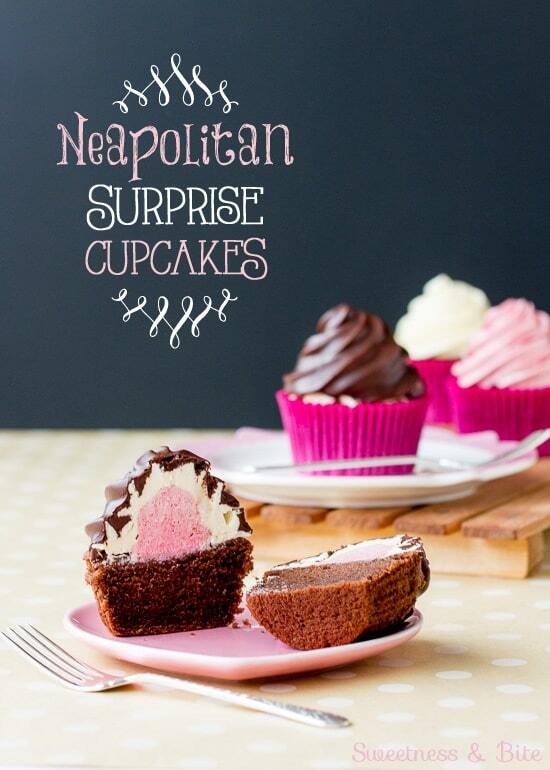 I was reluctant to call these cupcakes Neapolitan Surprise Cupcakes, because usually the idea of surprise food terrifies me. I’m a pretty fussy eater, partly because my stomach has some issues with certain foods, and partly because I have a palate so sensitive that my father thinks I should train as a wine taster. Yep, I’m the person who can taste pears and nectarines in a pinot gris. Even though I don’t really like wine. Or nectarines. See my point? So if you were to give me a ‘surprise’ food, I would likely politely decline unless you ‘ruined’ the surprise by telling me exactly what it was. Which kinda makes it not a surprise. But much better no surprise than bad surprise. But these, oh boy, these cupcakes are a good surprise. Well, they would have been a good surprise for me, had I not made them and known exactly what was in them. 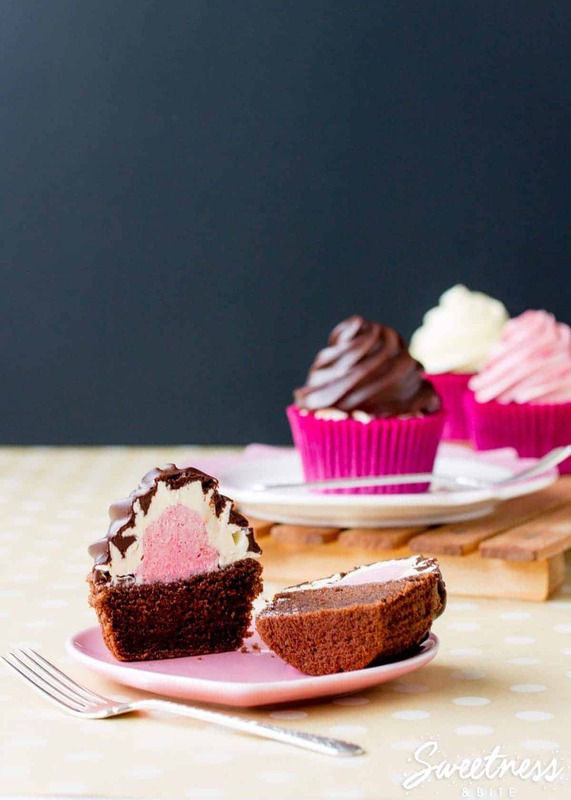 Light chocolate cupcakes, topped with strawberry and vanilla Swiss meringue buttercreams and dipped in a gorgeous shiny dark chocolate shell. Half of the batch had a strawberry buttercream centre with a vanilla swirl, and the other half was the other way around. More surprise! These look like I tried super hard to hide one flavour of buttercream inside the other, but really all I did was pipe a cone shape of buttercream in the centre of the cupcake with a round tip, and then pipe a swirl around it with a star tip. My one concession to my aversion to food surprises was that I didn’t fuss around trying to cover the buttercream completely with chocolate, so you can tell which ones were which, but if you want it to be a complete surprise, you can take a little more time with each cupcake to make sure the buttercream is totally hidden. Now, this bit here isn’t actually a gratuitous, any-chance-I-get use of a teacup. 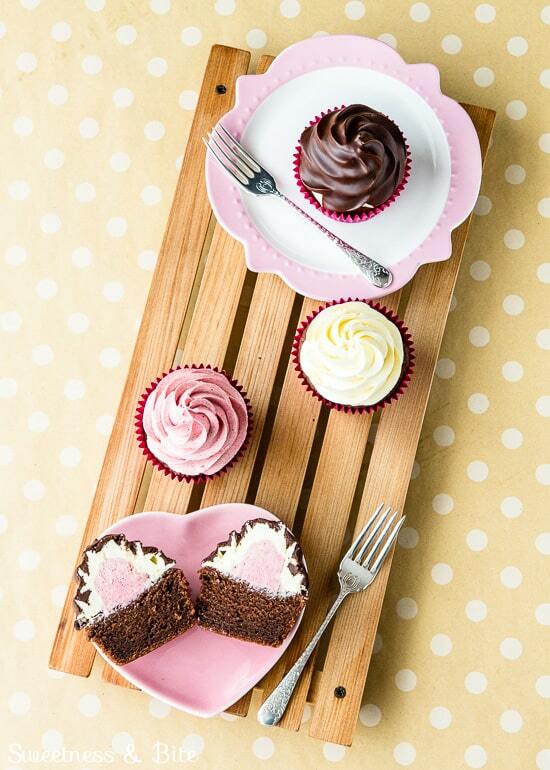 Funnily enough, a teacup is actually a pretty perfect vessel for the chocolate used to dip the cupcakes. 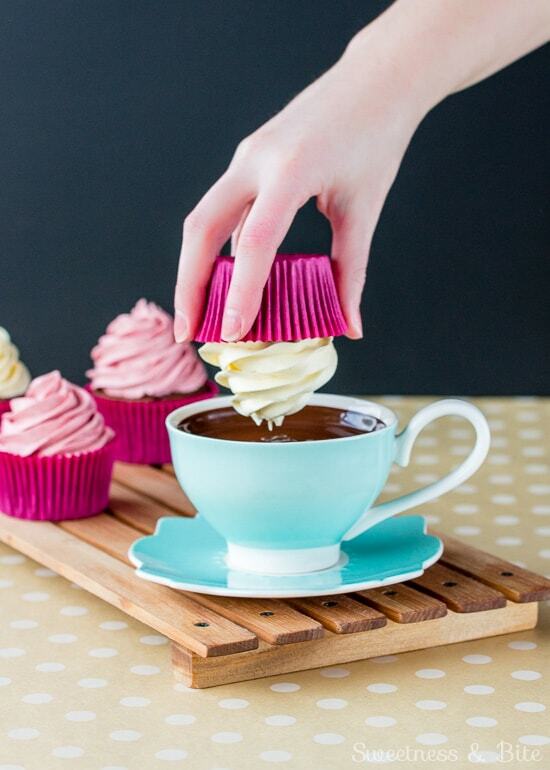 Whatever you use, it needs to be deep enough that your cupcake swirl won’t reach the bottom, and just wide enough to dip the cupcake, plus a little extra room for your fingers. Holding the cupcake by the top of the paper, dip it into the chocolate mixture until the edge of the paper *almost* touches the surface of the chocolate. 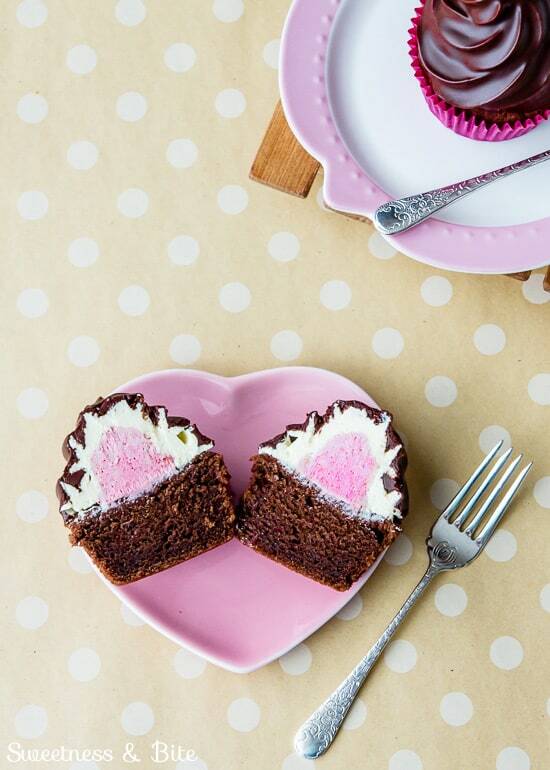 Wiggle the cupcake gently to make sure the chocolate is all up in that swirl. Gently lift it out, and hold it above the cup to let the excess chocolate drip off. 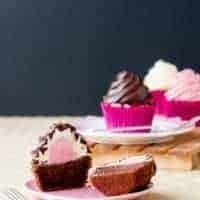 Light chocolate cupcakes, topped with strawberry and vanilla Swiss meringue buttercreams and dipped in a gorgeous shiny dark chocolate shell. Preheat oven to 180°C. Line two 12-hole muffin tins with cupcake papers. Roughly chop the chocolate and place in a heatproof jug. Pour over the just boiled water and stir until the chocolate melts. Leave to cool. Turn the mixer down to low speed and add the flour mixture and the chocolate mixture alternately, beating briefly between additions to combine. Scrape down the sides of the bowl, then add the sour cream and mix on low speed until just combined. Use a spatula or wooden spoon to give the mixture a last stir by hand, making sure to scrape right down to the bottom of the bowl. 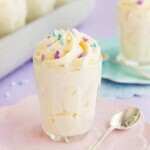 Use a medium sized ice cream scoop (or use two spoons) to fill the cupcake papers approximately halfway. Bake for 15-18 minutes, or until the cupcakes spring back when touched lightly with a finger, and a skewer inserted into the middle will come out clean. If you only have room for one tray of cupcakes at a time, the other tray will be fine at room temperature while the rest cook. Remove the cupcakes from the pan as soon as your fingers will let you. Don’t burn yourself but don’t wait too long either or the cupcakes may pull away from the papers. Leave cupcakes to cool completely before icing. Thoroughly clean the whisk attachment and heatproof bowl of a stand mixer, and wipe with a paper towel dipped in lemon juice or vinegar to remove any traces of grease. Combine the egg whites and sugar in the mixer bowl. Place the bowl over a pot of just-simmering water. 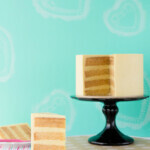 Stir constantly until the sugar has dissolved and the mixture reaches 71°C/160°F. Place the bowl on the mixer and whip on medium speed for one minute, then increase speed to medium-high and beat until the meringue is stiff and glossy. The mixer bowl should be cool to the touch. Switch to the paddle attachment, and with the mixer on low speed add the butter a piece at a time until fully incorporated. If the mixture seems to curdle or separate, don’t panic! Just keep the mixer going on low speed until the buttercream becomes silky and smooth. Add the vanilla extract and beat again to combine. Remove half of the buttercream to another bowl. Sift the strawberry powder into the remaining buttercream. Add in the food colouring if using. Beat on low speed until combined. Prepare two piping bags with large couplers, and place one colour of icing into each bag. Place the round tip onto the bag of vanilla icing, and pipe a cone shape of icing onto half of the cupcakes. Rinse the round tip, place it on the bag of strawberry icing, and pipe cone shapes onto the other half of the cupcakes. Remove the round tip from the strawberry icing and replace it with a star tip. Pipe swirls of icing around the cones of vanilla icing. Start by piping a ring around the base of the cone, then move the tip upwards around the cone as you pipe. Wipe the tip between cupcakes. Rinse the star tip, place it on the vanilla icing bag and pipe swirls onto the strawberry cones. 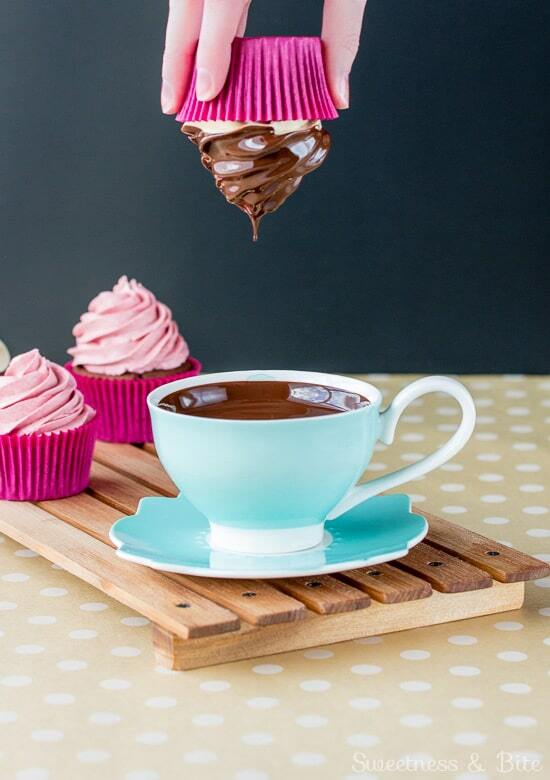 Chill the cupcakes while you prepare the chocolate dip. Place the chocolate in a microwave safe bowl or jug. Add the oil. Microwave on 50% power for one minute. Stir, then heat again at 50% in thirty second bursts, stirring after each burst, until melted and smooth. 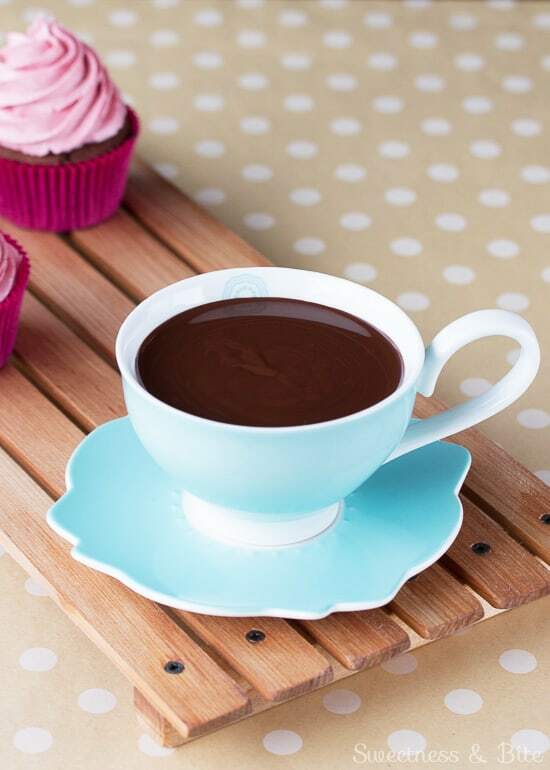 Pour some of the chocolate dip into a teacup or small bowl. 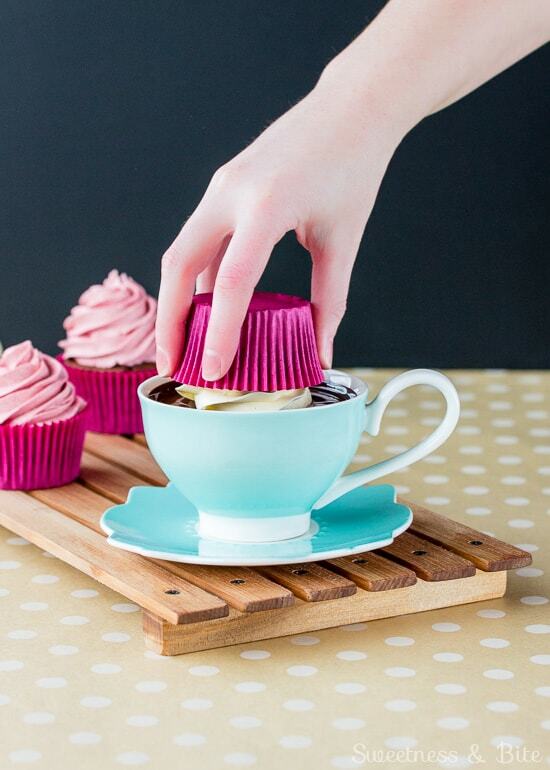 Whatever you use, it needs to be deep enough that your cupcake swirl won’t reach the bottom, and just wide enough to dip the cupcake, plus a little extra room for your fingers. Fill the cup or bowl almost to the top (leave about 1cm or so). Holding the cupcake by the top of the paper, dip it into the chocolate mixture until the edge of the paper almost touches the surface of the chocolate. Wiggle the cupcake gently to make sure the chocolate is all up in that swirl. Gently lift it out, and hold it above the cup to let the excess chocolate drip off. If any little patches of buttercream are still showing, you can use a skewer dipped in more chocolate to dab over the gaps. After you dip all of the cupcakes, you can either place them into the fridge for 10 minutes or so until the chocolate is set, or leave them at room temperature until the chocolate sets – how long it takes will depend on your room temperature. Store the cupcakes in an airtight container at room temperature for up to two days. These cupcakes work perfectly with gluten or without. If you don't need them to be gluten free, just use all purpose flour and omit the xanthan gum. 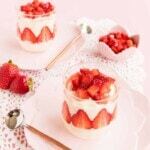 Freeze dried strawberry powder is available in gourmet food stores, some supermarkets and online. To do the 'surprise inside' icing you will need two piping bags, two large couplers, a large star tip (I used a Wilton 1M) and a large round tip (I used a Wilton 1A). Obviously if you have two of each of these tips, it’s a bonus, you won’t need to rinse them. Hi! Do you think I could use Greek yoghurt instead of sour cream? Hi Tania. I’m not 100% sure if Greek yoghurt would work quite as well as sour cream, but there is only one way to find out! 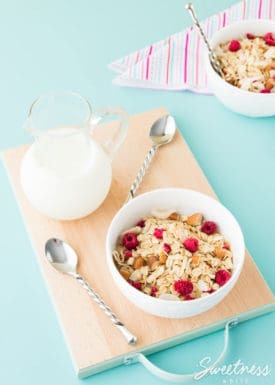 🙂 I think it would have a good chance of working if you got a really thick Greek yoghurt, similar to the consistency of sour cream (or if you couldn’t get a really thick one, pop some paper towels into a sieve over a bowl, spoon the yoghurt into the paper towels and then let it sit in the fridge for a couple of hours and some of the liquid will drip out, leaving super thick yoghurt). Good luck and I’d love to know how it goes! Thank you so much! I will give it ok this week for my sons first birthday. I made these today and they are utterly delicious! Thank you so much for a totally brilliant recipe. The Greek yoghurt worked beautifully. I used sorghum flour as I was out of rice flour and used corn flour instead of potato starch for the same reason but stuck to your quantities. Thank you for making our hearts and tummies very happy. I have frozen some to enjoy another time. Aargh! 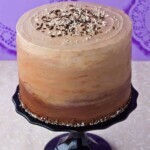 How do you stop the whole frosting swirl falling off the cake when you dip it in the chocolate? I know how easily swirls can be parted from their cakey bases as I have to redo some of mine when I’m not happy with the piping, and just tip it up, give it a little shake, and off that baby comes! Hi Joanne, I tend to give the cupcake a bit of a tap on the bench after I’ve piped the swirl, which helps to settle the buttercream down onto the top of the cupcake (and it also fills in any gaps and spaces that sometimes happen when the swirl is being piped). Once the cakes are chilled the buttercream should be pretty well stuck. Having the chocolate at the right consistency is quite important too, if it’s too thick then the weight of it could pull the buttercream off. I’ve made these many times and haven’t had the buttercream fall off, but just quietly if it did happen to, as long as the buttercream was still chilled and firm and didn’t get smooshed, I’d probably try sticking it back onto the cupcake with a bit more chocolate. And then not tell anyone 😉 Hope that helps you next time! 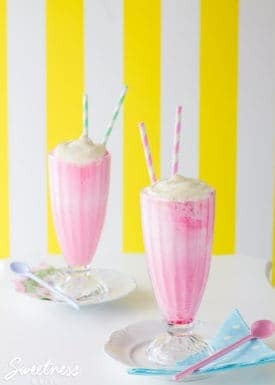 Would these super yummy looking cupcakes be best made on the day of ‘presenting’ or could I make them the day before? Hi Lorraine, these cupcakes actually keep quite well, so you can bake them the day before. I find they’re very light and spongey the day they’re made, and they settle a bit overnight so they’re actually a bit easier to eat the next day because they’re not so delicate, but still light and moist. Just be aware that if you keep them in an airtight container there is a slight risk that the cupcake papers will pull away from the cakes, it really seems to depend though on the kind of papers you use, so if you haven’t had that problem before with the kind of papers you use, then they should be fine. Just something to keep in mind. Hope that helps ? 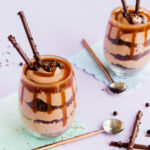 Wow, I have to say – I made them and they were such a HUGE hit!! Not only were my guests gaga over the melted chocolate over the buttercream, but loved it when they bit into the yummy raspberry hiding inside. It was a real thrill to see their faces enjoying them so much. 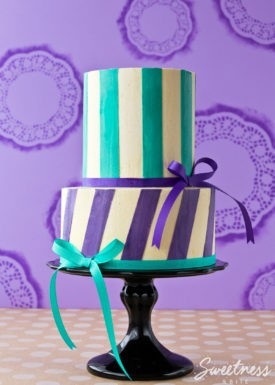 I have never made that style of buttercream before either, but I am totally sold on it now. It is much nicer to eat (no grainy gritty bits of sugar) and by far not as sweet which seems to suit a lot more people’s tastes. I am a regular browser of your website – will you be adding more soon? (please?). I enjoy all the funny stuff you write too by the way. Brightens my day. 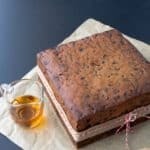 Can You Ganache A Fruit Cake?